Disclaimer: this might be the most satisfying smoothie we’ve ever made! 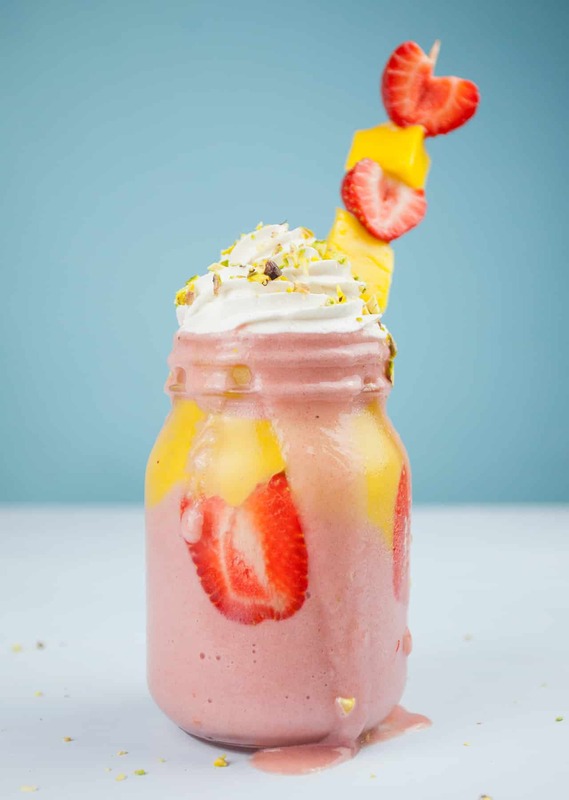 We love a fruity smoothie in our household, but every now and then we like to take them to the next level and experiment with multiple layers and fun decorations. This smoothie combines three of our favourite fruits: banana, strawberry and mango. These fruits give the smoothie a lovely bright and vibrant colour. The crushed pistachios, which we end up mixing into the smoothie, give this recipe a crunchy texture (and they look great on top!). Remember, the trick to getting the coconut cream to separate from the water is using a can of coconut milk with high fat content. You can usually tell by shaking the can in the supermarket to see if it’s already separated. If you can’t hear it shaking around, then it’s usually a safe bet! Slice the banana into small pieces and put the pieces inside an airtight container, then freeze for at least 2 hours or overnight. Meanwhile, place the can of coconut in the fridge for at least a few hours or overnight. Next, take one of the strawberries for decorating and cut it into slices half a cm thick. Then press each slice firmly onto the inside of the serving jar. Make sure the inside of the jar is dry, otherwise the slices might not stick. Blend together the ingredients for the strawberry layer and pour three quarters of the mixture into the jar. 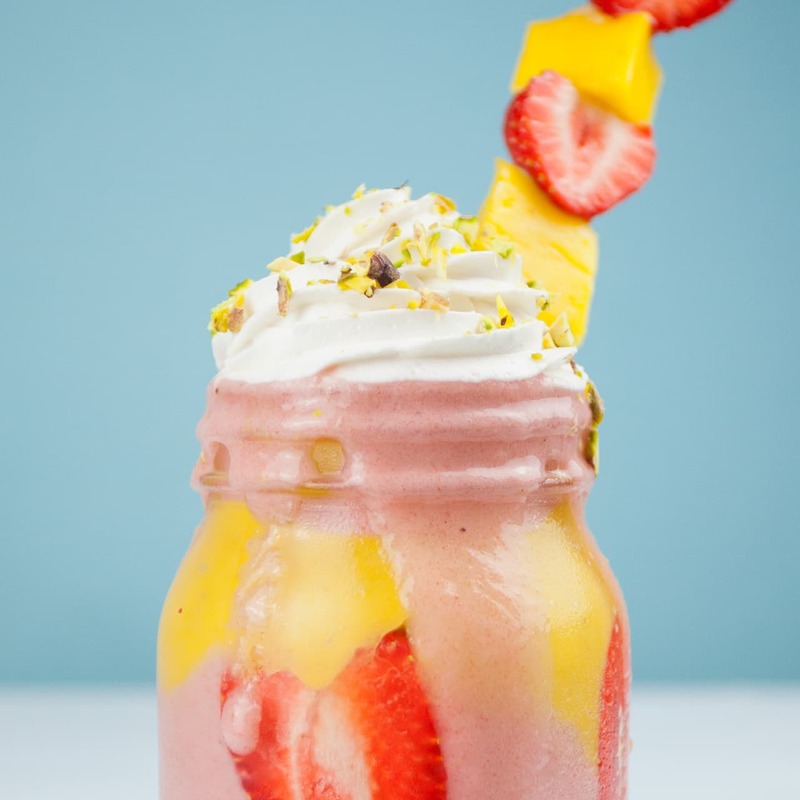 Next, blend the ingredients for the mango layer (leave a couple of pieces of mango to one side for decoration) and gently pour the entire mixture into the jar on top of the strawberry layer. If you like clean layers, use the back of a spoon to gently guide the mango layer on top. Top with the remaining strawberry layer. Remove the can of coconut milk from the fridge and open. Scoop out the coconut cream that has settled at the top and transfer to a mixing bowl. Note: if the coconut cream hasn’t separated from the water, there probably wasn’t enough fat content in the can. Beat the coconut cream until light and fluffy, then transfer to a piping bag. Pipe the coconut cream on top of the smoothie and sprinkle with crushed pistachios. Take the remaining strawberry used for decorating and cut it in half. Then take the remaining mango pieces, add both fruits to the wooden skewer and carefully place the skewer inside the jar so the fruit pieces poke out of the top. You will also need a 1 litre Kilner jar or similar.